These engaging earrings are just the right touch for dressing up an outfit for an evening out on the town. 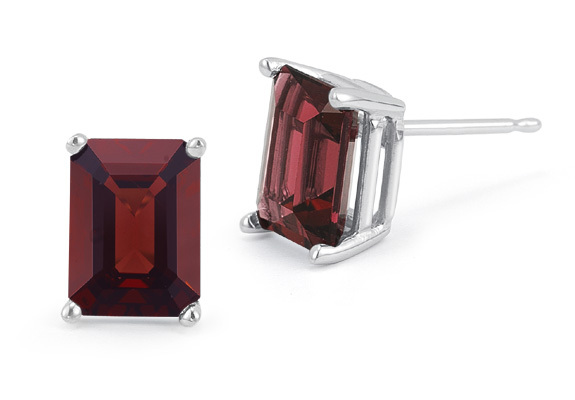 Easy to wear and easy to match, the 3.40 Carat Emerald-Cut Garnet Stud Earrings will add fashion and flare to any wardrobe. These attractive earrings feature a modern design based on showcasing the lovely shape and color of the garnets (8mm by 6mm). Cut in a hip rectilinear shape that leaves parallel steps in the stones, the garnets give off the illusion of having many smaller rectangles of pigment within. As the light moves across the stone, a range of colors appear including hues of cherry red and burnt sienna. The garnets sit nicely in a 14k white gold setting that hugs each stone along the four corners and creates a platform for a gold post and push back.